Letter and postcard writing is a big part of my life. I have been a postcrosser for over 3 years and I have 7 penpals – a few friends from college but also some I have never met. My husband and I also have a long tradition of writing letters as he is in the military and when we are separated we write each other letters." 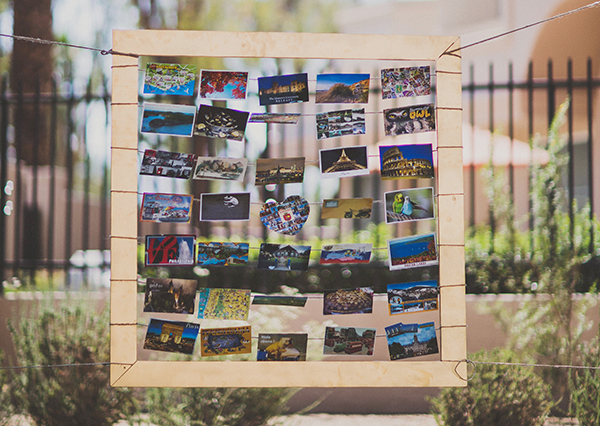 For some time before the wedding, Caitlin collected postcards from different places via Postcrossing. She then used her favourite received postcards to make a back drop in a frame for cocktail hour. She also collected blank postcards and had all her guests write notes on them… a guest book of sorts, written on postcards. A friend then saved the written cards, and will be in charge of mailing them to the couple throughout the year. Brilliant! What did people write on the cards? Caitlin says a little bit of everything, from advice for the newlyweds to kind words about the wedding… They’ve gotten a few of them back already, and had a lot of fun reading the spontaneous messages from their special day. What a fantastic idea. Congratulations! Congratulations! What a great idea, if I were ever to be married again (:)) I would do it too! Long a happy marriage Caitlin&husband! Best wishes to new family! Congratulations on your special day!! Here's to many happy years. Love this! Need to plan my own wedding within the next few years -- might snag a few ideas. 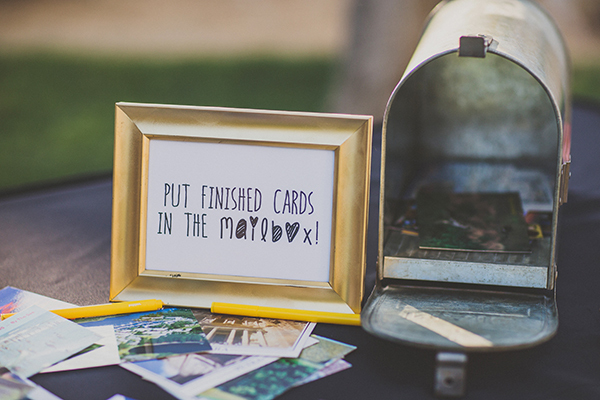 Such a wonderful way of integrating postcards into their own special day. Congratulations! 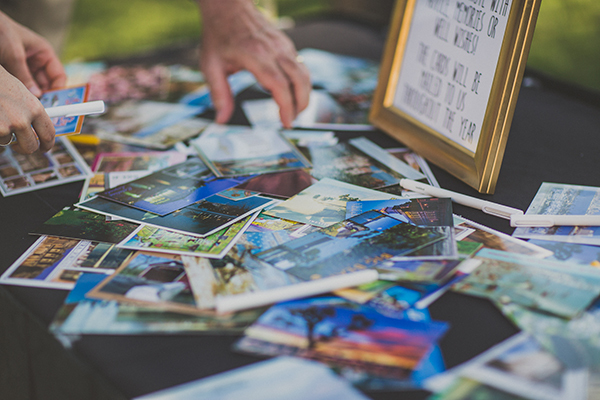 What a great way to integrate your love of writing and postcards! Very creative and fun! I predict a long and adventurous life together! Congratulations!! It is an amazing idea! Congratulations! such a nice idea!!!! and congrats for the newlyweds!!! Wow, what an awesome and interactive idea. Hope you had fun reading it and all the best for the future. What a wonderful idea! How special is it that now they are receiving cards from their friends and family who were there on their wedding day. Congratulation for your wedding!!! !Fantastic idea. I think I am going to hire you to be my future wedding planner, haha. You did an awesome job! What a creative idea. I just may borrow it for my 50th birthday party in November. Congratulations and wishing you many happy years together. awesome idea ! all my congratulations ! Congratulations! And that idea is amazing! What a great idea. You will enjoy receiving the cards throughout the year. Congratulations on your wedding. Something to think about what we did for my daughter's baby shower. We had all the guests write a card for each birthday up to 21, which her granddad wrote. This is given to her on every birthday. Congrats! Congrats! Such a marvellous idea must have brought you loads of sweet memories! Best wishes! Lovely idea - Wishing you a happy life. Warm Wishes & Congratulations to you & your hubby, Caitlin. What a wonderful, inclusive idea! I hope your mail-box is always full of cards, old & new, & that you share many happy years together. God Bless you both. Great and original idea! Congratulations! Such a sweet idea to have quests write you postcards! Congratulations and Best Wishes to you! 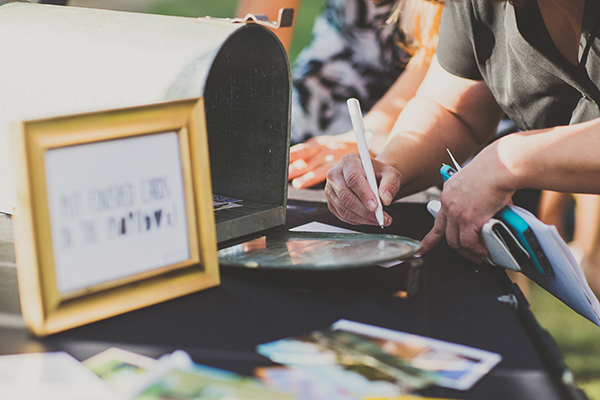 I had a similar idea for a friend's wedding: I chose 52 postcards, wrote the week number and the couple's address on it and then the wedding guests had the chance to grab a postcard during a dancing game. Then they will have to send the postcard to the couple during the week which is written on the card. I hope the couple will have one card every week in their first year of marriage! 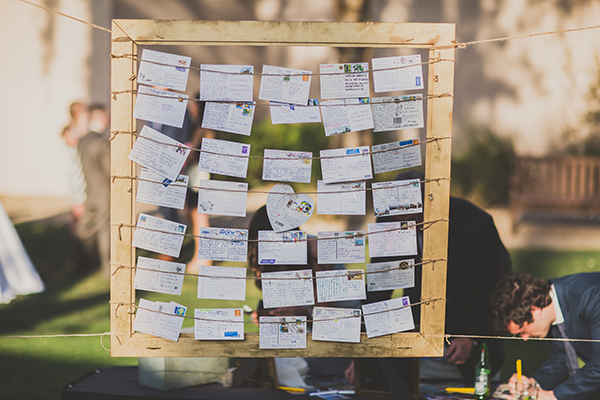 What a wonderful and creative way to receive postcards from friends who were at your wedding. Congratulations! & all the best for your married life. What a wonderful idea!!! I love this. Congratulations on your wonderful day, many happy years ahead for you both. Please thank your husband for his service to our country.